This DTC is stored when the blind spot monitor sensor RH detects a ground short in the blind spot monitor indicator RH. With the blind spot monitor main switch assembly (warning canceling switch assembly) on, the voltage output from the blind spot monitor sensor to the indicator is low for a certain amount of time. (b) Recheck for DTCs and check if the same DTC is output again (See page ). 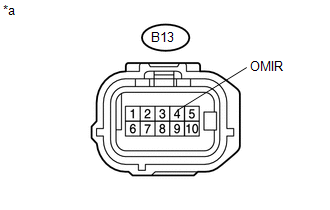 (a) Disconnect the O3 outer rear view mirror assembly RH connector. (b) Disconnect the B13 blind spot monitor sensor RH connector. (a) Reconnect the O3 outer rear view mirror assembly RH connector. (b) Disconnect the blind spot monitor sensor RH connector. (c) Disconnect the B outer rear view mirror RH connector. 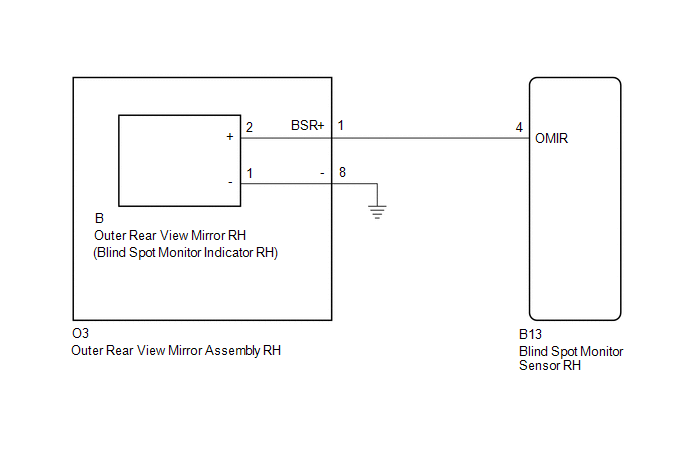 (a) Replace the outer rear view mirror RH with a new or normally functioning one (See page ). (c) Recheck for DTCs and check if the same DTC is output again (See page ).